"Learning is like mercury, one of the most powerful and excellent things in the world in skillful hands; in unskillful, the most mischievous." Inez Stannert had nowhere to run. Nowhere to hide. Since she couldn't escape the purgatory that was the confined and crowded stagecoach, Inez tried to let the droning voice of the man seated across from her wash over like the water in a mountain stream. But Edward Pace, Boston businessman and investor questing after yet more wealth in the West, went on and on. His monologue was interrupted only by the occasional screech from one of his three children—pushed beyond endurance by the heat, the cramped quarters, the dust—or punctuated by the muffled shout of "G-long!" or "H-up!" from the coach driver on the seat above them. Mr. Pace's voice accompanied the rhythmic cadence of horses' hooves as they pounded mile after mile of red dirt roads. Yesterday, the coach had stopped only for short rest breaks and a non-restful scant handful of hours sleep at a "hotel" in Fairplay. Today, the hapless passengers continued their journey, crammed together shoulder to shoulder, thigh to thigh, as the coach steadily lengthened the distance from their starting point in Leadville and drew ever closer to their destination of Manitou. The coach was now edging toward Florrisant, and the final descent out of the high peaks of the Rocky Mountains to the lesser lands at the edge of the mountain range. The end of the trip could not come soon enough. Inez clenched her hands, fingernails biting through thin leather gloves. The backs of the gloves were covered with the fine dust that swirled throughout the interior of the stagecoach. 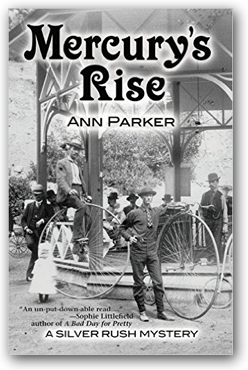 A rusty tinge painted every surface and every passenger—Inez, her friend and traveling companion Susan Carothers, the Pace paterfamilias, his wife, their three children, and the unintroduced nanny. Inez fervently wished the dust would simply choke Mr. Pace into silence. But Lady Luck was betting against her, and the businessman appeared impervious to the dust's strangling effects. Behind Inez's traveling veil—which had proved almost useless in keeping the airborne dirt at bay—sweat trickled from her hairline, down temples and cheeks to drip off her chin. The clattering stage rocked forward, back, forward, back: a metronome in motion, a mother's nudge to a cradle. There was a sudden, violent pitch forward, a sharp jerk back, a whistle from the driver above, and the snap of a whip. Inez, crammed on the leather seat between her friend Susan and the nanny, clutched Susan's arm to keep from falling forward into Mr. Pace's lap. As the stage lurched from rut to rock, a hard jolt shuddered through the thinly padded leather seats. Pain raced up Inez's back, tracing the corset laces, and set her teeth rattling. She bit the inside of her mouth to keep from uttering an oath that, most likely, would have stopped the businessman dead in his oratorical tracks. The two older Pace children—a girl of about five and a boy of perhaps three—yelped. Mrs. Pace turned to them with a "shush," her brown-gold hair a muted flash beneath her own dust-coated veil. The youngest child, a baby planted in the nanny's lap, uttered not a peep. A strand of drool made a rusty wet streak across one chubby cheek. Crowded by Susan and a stray hatbox on one side, and by the ample proportions of the nanny on the other side, Inez felt her temper rise from a simmer to a boil. She prayed more fervently than she had in a long time that the next stage stop was near. If I must endure many more hours of this, I fear I'll do something fatal to my reputation. Undeterred by the howls of his progeny or the ruts of the road, Pace leaned toward Inez, his knees jostling her own, nearly spitting at the net covering her face. "The air is so vile in Leadville, it is a wonder that the entire population is not sickened to the point of disease." Behind her veil, Inez's upper lip curled as Pace continued to vilify the town they'd left yesterday. She glanced at Mrs. Pace. Sitting at her husband's side, the woman appeared immune to her husband's vitriolic speechmaking and instead whispered urgently to the boy and girl beside her, who alternately squirmed and jabbed at each other. After one particularly hard poke to the ribs from his sister, the little boy lashed out with a grimy laced-up boot, leaving a dusty streak on the nanny's long skirts. "Enough!" the nanny snapped. The boy froze, sullenness stamped on features a miniature of his father's. Inez reflected that, given the history of the past hour, the two would be back pinching and jabbing each other within a space of minutes. And there had been some very, very long hours since leaving Leadville the previous morning. Inez had stepped up into the coach sent to bring them from Leadville to Manitou's Mountain Springs House if not with a high heart, at least with a hopeful one. It was a journey she had long been anticipating: In two days, she would rejoin William, her not-quite-two-year-old son whom she had not seen in a year. The sweat beneath her travel clothes damped the locket stuck to her skin, the locket holding a photograph of William at eight months. Inez shifted on the seat. Her hip bumped the nanny, who managed one evil glance before turning to the baby in her clutches. "There's a little dumpling," she cooed, rocking him with her knees in time to the coach's sway. The infant's head lolled on her lap. As far as Inez could tell, the "little dumpling" was out cold, no doubt thanks to the liberal dosing he'd received of Ayer's Cherry Pectoral. Inez had sneaked a peek at the label as the nanny had struggled to uncork the bottle while baby Pace was engaged in one particularly intense infantile fit. The tonic had effectively rendered mute his non-stop screaming, crying, and coughing. "Furthermore, the mines in Leadville are played out." Pace settled back against the coach seat, pulling out a limp linen handkerchief from his wilted travel suit and mopping his pale, dust-streaked face. "The management of such is lackadaisical and not prepared to handle the workers with the firmness required. Witness the strike of May. Poorly handled, all around." Unable to stand it any longer, Inez said loud enough to drown him out, "Pardon, Mr. Pace, I am curious as to what brought you to Leadville to begin with, if all it held for you is a dark and bleak vision more suited to Hades' world than our own?" Pace stopped talking. She was pleased to see that her words, or perhaps it was her tone, had done what the road's ruts and rocks could not. For a blissful moment, his mouth hung slack and without sound. His dark mustache, no longer so impeccably groomed, was streaked with damp and dust. He looked as astounded as if the leather side curtains had suddenly given voice. Susan's black-gloved hand crept over to cover Inez's balled fist, a mute warning to watch her tongue. Pace removed his Homburg and swiped at his streaming forehead. Inez noted with a nasty curl of satisfaction that although his mustache was carefully blacked, his hair was iron-grey. That, and the lines on his face, placed him on the far side of fifty, at a guess. She risked a sidelong glance at the veil-shrouded missus beside him. Inez had judged the wife and mother at about five-and-twenty, no more. Inez's brow contracted in sympathy. There could only be money behind this union. His or hers, she wondered. Inez had seen Mrs. Pace without her veil a few times now, the longest stretch of time being the previous evening at the Fairplay hotel, where they had stopped for the night. Having vowed to not imbibe on the trip, Inez had found the Fairplay evening, apart from the respite of the coach ride, less than stellar. The food was wretched, and the company for the most part dull. Excusing herself early, Inez had repaired to the room she was sharing with Susan for the night to do a more thorough wash than the hurried splash of hands and face she had managed before supper. Inez was brushing her hair when Susan had knocked and entered an hour or so later. Inez set her silver-backed hairbrush on the simple desk that served as a dressing table and said, "I am sorry I suggested taking the stage to Manitou, Susan. If we had gone by train, as I originally planned, you would not have to endure this miserable trip." "Oh, no, Inez, I'm enjoying it. Well, mostly. The dust is quite something, isn't it?" Susan took a clothes brush and vigorously attacked her travel cloak, hanging on a wall peg. "Some of the scenery is wonderful. I'm making notes for later. Too, I'm thinking, there's a spot east of Leadville that is perfect for capturing the city with a stereoscopic camera. I could sell stereoviews like Mrs. Galbreaith's views of Manitou." She stopped brushing and pulled a stereoview card out of her coat pocket, examining the twin stereoscopic image on the front. "I'm so honored that Mrs. Galbreaith offered to share her photographic techniques and that I can stay in her boarding house for the duration." She flipped the card over. "It is quite clever of her to list the different springs in Manitou on the back, along with their mineral compositions. I shall have to think of something similar to say about Leadville. 'Manitou Springs—Saratoga of the West' sounds so romantic. Maybe I could offer up 'Leadville—Silver Sensation of the Rockies.' Or 'Leadville—Cloud City of the West.'" Inez sighed. "I just wish things had worked out as I had planned. I had thought we would have the coach to ourselves and be able to stop whenever you wanted. I had not counted on the Paces appearing, seemingly out of nowhere, and demanding passage to the Mountain Springs House as well. Now, there is no stopping to gaze at the scenery, and I am sorry for that." "It is all right, Inez. We still have the train ride back to Leadville, at the end of the trip. This way, we get to see more of the country. I truly appreciate you underwriting this trip and supporting my efforts to expand my business. " "You have a rare talent. I cannot imagine a better way to invest my money than in helping you with your enterprise. Others may grubstake prospectors and pray for a silver bonanza. I prefer putting my money into a surer operation." She smiled briefly at Susan. "I have seen you as you weathered good and bad times. You are careful with your profits and minimize your losses. Your business sense is sound." Susan blushed in the light of the oil lamp. "Thank you. That is high praise from one of the most successful businesswomen in Leadville." A sudden jolt brought Inez back to the confines of the stagecoach. Mr. Pace was saying, "Well. Since you ask, Mrs. Stannert, my business in Leadville involved an exploration of possible investment opportunities. My wife's father has much to do with metals and thought I should investigate." In a gesture that mimicked Susan's, Mrs. Pace placed a gloved hand over his. His fingers, clamped tightly atop his bony kneecap, visibly relaxed beneath her touch. Behind her veil, Inez raised her eyebrows, intrigued. "And, you, Mrs. Stannert?" He spoke stiffly, as if unused to making polite give-and-take conversation. "Do you and your husband reside in Leadville?" Susan's hand gripped tighter as Inez's fist spasmed. "Indeed," she said, ignoring her growing rage. "We, that is to say, Mr. Stannert has a number of business ventures in town." "Indeed." He echoed her and gave her that odd look again. It was a cousin to the one he'd provided at their introduction. On hearing her name, he'd done a visible double-take, then stared with increasingly narrowed eyes, before finally offering her a stiff short bow. She had held her breath, to see if he would add anything damning, such as "You are that harlot who runs the saloon on Harrison and State streets!" He didn't, but for that moment, it seemed as if he knew her, or knew of her, and not in a positive way. Inez had racked her mind, but could not recall having seen him in the Silver Queen Saloon. When he said nothing after his bow, she had decided to let it pass. Realizing her musings had taken her mid-explanation from the conversation, she added belatedly, "What with all his various undertakings and his many investments in Leadville, Mr. Stannert decided it was best for us to remain in the city year-round. To keep an eye on things." "Leadville is a hard place for a gentlewoman," Pace remarked, glancing at his own wife. Inez smiled tightly. A sudden flash of memory from the previous week: her reflection in the Silver Queen Saloon's dressing room mirror, hair in place, evening gown a rustle of satin and silk, diamonds glistening at her neck, brandy goblet on the washstand, and pocket pistol tucked safely in a hidden pocket. Her regular Saturday night visitors waiting across the hall for her to appear and for the late-night high-stakes poker games to begin. "You are staying at the Mountain Springs House for the rest of the summer season, then? Are you intending to take the waters?" The wife's question could scarcely be heard over the creaks of the coach, the squeaks of horse tracings, and the clatter of hooves. "Miss Carothers and I are staying in the area for a short while. I imagine we will sample the mineral springs while we are there." Inez started to say more, then stopped. No need to explain her personal business to these people. No need to tell them that she was on her way to see her sister Harmony and her own son William, whom she had not seen since the previous August. Definitely no need to explain that the reason her husband, Mark Stannert, was not in the coach beside her was because she had threatened to put a bullet through him if he were to accompany her to Manitou.